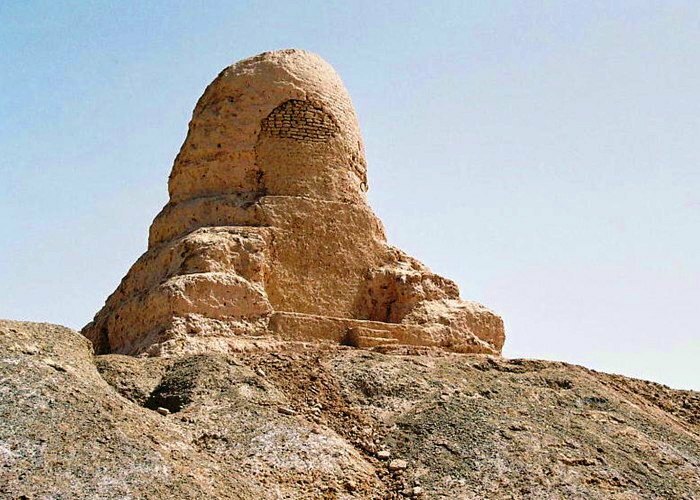 Originally built in the Tang Dynasty (618 -907), Mor Buddhist Pagoda is situated on a sand dune in the middle section of the ancient Matag Mountain, which is more than 20 kilometers east of Kashgar City. It is surrounded by the mountains and the wilderness. The building consists of an oval-shaped earthen pagoda and a covered high platform. There are two damaged pagodas in the site of Mor Buddhist Pagoda. There is a group of monks’ dormitory ruins in the southeast. There is a row of ancient Karez wells on the sand below the slope. The Karez winds for about 1 kilometer long. It was the water supply for the monks at the temple in ancient times. Ash was discovered at the wood in a section of the lower part of the ancient temple ruins, which shows that the temple was destroyed in a fire. Unfortunately, the temple was destroyed at the early 10th Century in a war. The hollow Mor Buddhist Pagoda in the southeast is around 13 meters tall. There are 3 layers platform under the pagoda. The body of the pagoda was built with wheat straw and loess. You will find the holes made by the foot on the upper part. It is specially used to collect the "relics" (that is, the bones of Buddhism founder Shakyamuni, including hair, nails and teeth and other relics). Another pagoda in the northwest stands like an inverted big bucket with a large bottom and a small top. The bottom is 25 meters long and 23.6 meters wide while the top is 14.2 meters long and 12.5 meters wide. The existing pagoda is 7 meters tall. There are remains of niche for Buddha in the front and sides of the pagoda. If you are planning to visit the pagoda for photography purposes, the best time to visit is during the sunset. There is no direct bus to the pagoda from Kashgar. The only option is to rent a vehicle. Please check out the weather on Google beforehand in case the sand storm attacks Kashgar. Interested in visiting the Mor Buddhist Pagoda on a Tour? Wendy Wei Tours offers a variety of different packaged tours as well as custom tours including the Mor Buddhist Pagoda, among other attractions and destinations. To find out more, please visit our Tours page or Contact Us directly to find out more.